Plans for Decommissioning Fukushima Daiichi have evolved over the last 3 years. The term decommissioning is what has been in use, but the process is more of a demolition and attempts to contain the massive amounts of radioactive contamination released during the meltdowns. As more became understood about the actual events of the disaster and the current state of the reactors a number of parties became involved. TEPCO began to see the enormity of the task along with the cost. With TEPCO clearly incapable of dealing with the disaster they made, the government and other parties have stepped in to deal with the problem. TEPCO has largely been relegated to being the atomic janitors of Fukushima Daiichi with more and more of the work being done by contract companies or these other entities. METI has taken on the role of coordinating government funded work towards decommissioning. They now manage funding and play some role in determining what technologies will be researched or used. More action now goes on in METI’s offices than at TEPCO’s related to dealing with the disaster. IRID was formed as a mash up of academia, industry and other capable parties to come up with ideas that could be used to try to deal with contaminated water issues and decommissioning the reactors. IRID initially solicited ideas to try to tackle the problems at Fukushima Daiichi from anyone in the world who wished to submit ideas. IRID’s committee sorted through the submissions to find ideas with merit or possibility. Those ideas were then suggested to METI and TEPCO. Some were concepts that could be implemented immediately, others required more research to make sure they would work. The ideas that required more research were handed off to Mitsubishi Research Institute. Mitsubishi Research Institute (MRI) is coordinating the assignment and oversight of the long list of research projects intended to test and verify technologies to be used at Fukushima Daiichi. METI provides the funding while MRI assigned the grants and coordinates the gathering of results from the various companies and academic institutions that submit proposals to do the research work. Some research projects were directly assigned from IRID/METI to be done. One such project being the testing of substances to plug the downcomer tubes of the reactors in an attempt to make them hold water. In a similar process Hitachi has been conducting research into a robotic technology that is intended to crawl the interior of the containment vessels to gather needed data that will help establish further planning for retrieving what is left of the melted fuel. 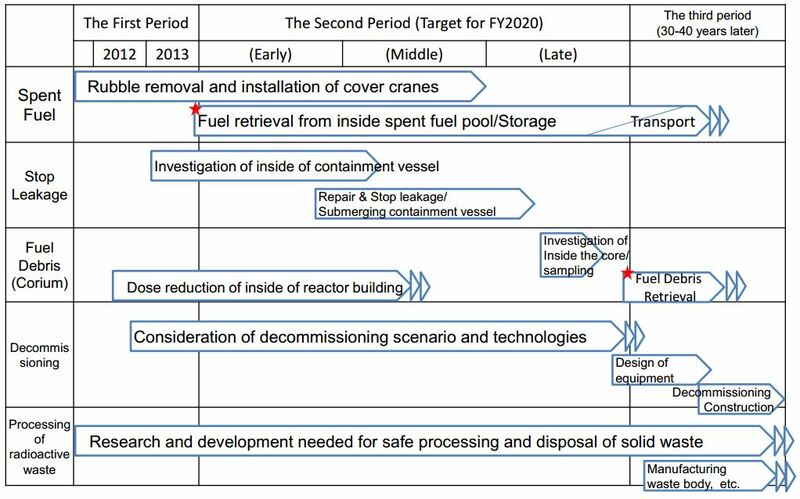 The various tasks being done at Fukushima Daiichi are far more than could be explained in one page. Sub pages of this section explain the various tasks by groupings and include reactor specific plans and timelines. These pages will be periodically updated as new information is released on the completion and planning at Fukushima Daiichi.